WWF is most concerned that the Marine Stewardship Council (MSC) certification of the Echebastar Indian Ocean skipjack tuna purse seine fishery has been granted in spite of major flaws in the assessment. WWF raised its concerns through a formal objection process but they were all dismissed. GENEVA, Switzerland (25 October 2018) – WWF is most concerned that the Marine Stewardship Council (MSC) certification of the Echebastar Indian Ocean skipjack tuna purse seine fishery has been granted in spite of major flaws in the assessment. WWF raised its concerns through a formal objection process but they were all dismissed. 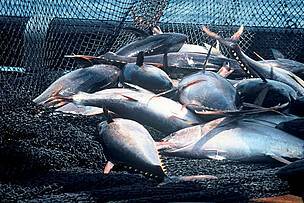 WWF recognises that the Echebastar Indian Ocean skipjack tuna purse seine tuna fishery has made a significant effort to enter the MSC certification assessment. However, WWF believes that it is premature for this fishery to be certified as meeting the standards of environmental performance commensurate with the MSC standard. WWF’s objections were made on the following grounds, in particular: although the Echebastar fishery targets skipjack tuna, a major portion of its catch is yellowfin tuna which is already overfished and for which no harvest strategy exists in the Indian Ocean (moreover, the effectiveness of rebuilding measures for yellowfin tuna stocks has not been assessed); the fishery uses fish aggregating devices (FADs) which increase the catch of non-target species and diminish the populations of already threatened ocean wildlife, including sharks; and that the management plans to reduce the mortality of sharks - particularly silky sharks - are inadequate. WWF considers that fisheries certification systems like the MSC can provide a useful incentive to help drive fisheries towards better environmental performance. Unfortunately, this has not been the case for the Echebastar Indian Ocean purse seine skipjack tuna fishery MSC certification process because the existing MSC standards have not been applied with sufficient rigour, in WWF’s view. Furthermore, WWF has raised a series of concerns about the application of the MSC standard, broadly, including the objection process. For the reasons outlined above, WWF recommends that seafood buyers should not consider this fishery as meeting a sufficient standard of environmental performance for MSC certification. WWF regards the MSC as the leading seafood certification programme in the world, but WWF is also advancing a reform agenda that it believes the MSC should adopt as a priority to ensure its effectiveness, and as pressures on the ocean increase. See here for WWF’s most recent public statement on this matter.